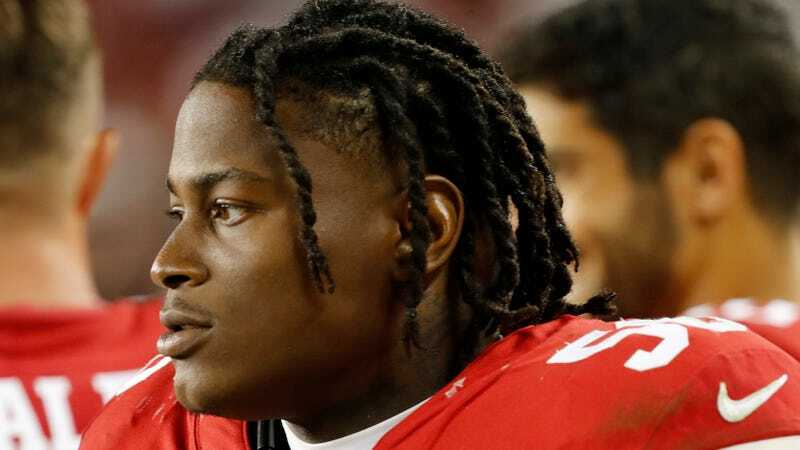 The Hillsborough County (Fla.) State Attorney’s Office has dropped the domestic violence case against inside linebacker Reuben Foster, according to online court records. The news was first reported by TMZ. You can see the notice of termination below, dated Jan. 2. No other information about why the charges were dropped was immediately available. Deadspin has reached out to the state attorney’s office, and this post will be updated if they respond. Foster was charged with misdemeanor domestic battery in November. According to the criminal report affidavit, Foster and his then-girlfriend got into a verbal fight, then Foster “slapped her phone out of her hand, pushed her in the chest area with one hand, and slapped her with an open hand on the left side of her face.” After the arrest, the 49ers released Foster, who was picked up days later by Washington. The girlfriend was Elissa Ennis, who had recanted a separate abuse allegation earlier in the year in California. In December, she was interviewed on Good Morning America and went into more detail about the abuse she said Foster inflicted that night in Tampa and why she had recanted, saying, “Because I loved him, and love will have you doing things that’s not in your best interests for the person you love.” Ennis also alleged that someone from the Niners—she did not say who—tried telling officers who arrived at the scene that she was the same woman who had recanted before. The 49ers issued a statement in response saying they “in no way impeded” the investigation.